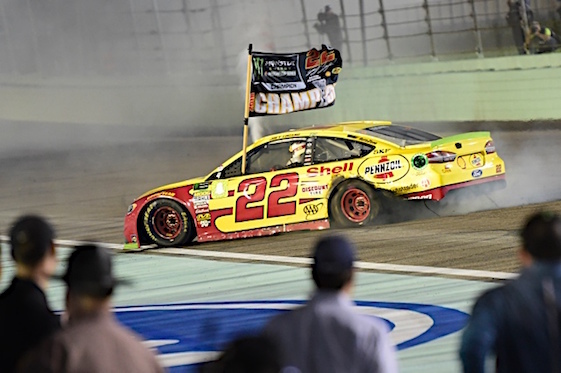 HOMESTEAD, Fla. – Joey Logano possessed one dream as a child – to be a NASCAR champion. On Sunday at Homestead-Motor Speedway his dream finally became reality. With a Ford that was powerful on the short runs, Logano bolted into the lead with 12 laps remaining and stretched his advantage to claim a 1.725-second victory over fellow title contender Martin Truex Jr. Kevin Harvick finished third and Kyle Busch fourth, making it the first time the four title contenders have finished 1-4 in the season finale at the 1.5-mile track. Logano got the opportunity to showcase his Ford’s short-run speed when teammate Brad Keselowski collided with Daniel Suarez and spun him with 19 laps remaining. When the race restarted with 14 laps to go, Logano was third behind Busch and Truex. Truex quickly grabbed the lead and held it for two laps before Logano took over. championship and Ford with its first manufacturer title since 2002. It was the first time since 1999 that Ford had won the driver and manufacturer titles. 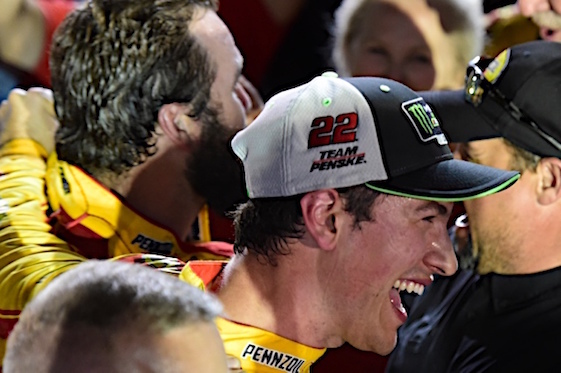 Logano’s championship also marks a phenomenal year for the 81-year-old Penske, who was elected to the NASCAR Hall of Fame, celebrated his organization’s 500th victory and his 17th win in the Indianapolis 500 before claiming his second Cup title. Team Penske, which already possesses 33 championships, still has the opportunity to pick up one more this year. Penske leaves Thursday morning for Australia where his driver, Scott McLachlan, possesses a 14-point lead in the V8 Supercars Series. For Gordon, a Cup championship was something the former limited super modified driver at Oswego (N.Y.) Speedway never envisioned. Logano joined Joe Gibbs Racing at age 18. He found himself thrust into a Cup car while still a teenager when Tony Stewart suddenly left to become a co-owner with Gene Haas. For the young Logano it was a gut-wrenching time. When Gibbs released Logano at the end of 2012, the then 22-year-old driver thought his racing days might have ended. However, Brad Keselowski convinced Penske he should hire the young driver and gradually Logano matured into a man with a family; a man who once again possessed the confidence he exhibited in his pre-NASCAR days. (5) Joey Logano (P), Ford, 267. (3) Martin Truex Jr. (P), Toyota, 267. (12) Kevin Harvick (P), Ford, 267. (2) Kyle Busch (P), Toyota, 267. (4) Brad Keselowski, Ford, 267. (17) Matt Kenseth, Ford, 267. (14) Chase Elliott, Chevrolet, 267. (26) Clint Bowyer, Ford, 267. (10) Aric Almirola, Ford, 267. (6) Kurt Busch, Ford, 267. (16) Austin Dillon, Chevrolet, 267. (1) Denny Hamlin, Toyota, 267. (11) Kyle Larson, Chevrolet, 267. (19) Jimmie Johnson, Chevrolet, 267. (8) Ryan Newman, Chevrolet, 267. (9) Ricky Stenhouse Jr., Ford, 267. (15) Ryan Blaney, Ford, 267. (21) Jamie McMurray, Chevrolet, 267. (20) AJ Allmendinger, Chevrolet, 266. (25) David Ragan, Ford, 266. (23) Bubba Wallace #, Chevrolet, 266. (31) Ty Dillon, Chevrolet, 266. (27) Chris Buescher, Chevrolet, 266. (28) William Byron #, Chevrolet, 266. (22) Paul Menard, Ford, 265. (29) Matt DiBenedetto, Ford, 264. (7) Erik Jones, Toyota, 264. (24) Michael McDowell, Ford, 263. (13) Alex Bowman, Chevrolet, 263. (18) Daniel Suarez, Toyota, 262. (32) Landon Cassill(i), Chevrolet, 262. (33) JJ Yeley(i), Ford, 261. (39) Ross Chastain(i), Chevrolet, 259. (34) Corey LaJoie, Chevrolet, 259. (36) BJ McLeod(i), Ford, 256. (35) * Kyle Weatherman, Chevrolet, 256. (38) * Timmy Hill(i), Toyota, 254. (37) * Tanner Berryhill, Toyota, 254. (30) Regan Smith, Chevrolet, 240. Average Speed of Race Winner: 133.056 mph. Time of Race: 3 Hrs, 00 Mins, 36 Secs. Margin of Victory: 1.725 Seconds. Lead Changes: 22 among 7 drivers. Lap Leaders: D. Hamlin 1-36; M. Truex Jr. (P) 37-39; M. McDowell 40-41; D. Hamlin 42; K. Harvick (P) 43-82; K. Larson 83; K. Harvick (P) 84-86; K. Larson 87-90; J. Logano (P) 91-104; K. Larson 105-117; K. Harvick (P) 118-119; M. Truex Jr. (P) 120; D. Hamlin 121-124; K. Larson 125-147; K. Harvick (P) 148-159; K. Larson 160-163; J. Logano (P) 164-166; K. Harvick (P) 167; J. Logano (P) 168-218; M. Truex Jr. (P) 219-230; K. Busch (P) 231-251; M. Truex Jr. (P) 252-255; J. Logano (P) 256-267. Leaders Summary (Driver, Times Lead, Laps Led): J. Logano (P) 4 times for 80 laps; K. Harvick (P) 5 times for 58 laps; K. Larson 5 times for 45 laps; D. Hamlin 3 times for 41 laps; K. Busch (P) 1 time for 21 laps; M. Truex Jr. (P) 4 times for 20 laps; M. McDowell 1 time for 2 laps.